My son, who is now two, doesn’t notice when his dad stumbles over the Hebrew words in the PJ Library books they read together. And he hasn’t been to church with Grams, so Isaac doesn’t know that when she takes communion he will stay seated. Eventually, however, he is going to notice that his cousins don’t go to Hebrew school, and that Daddy doesn’t come with us to High Holiday services. At some point he will ask about these differences, and initially my husband and I will have very straightforward answers for him: Along with Nona and Papa, and your uncle and cousin in California, Mommy and Isaac are Jewish. Daddy, Grams and your other cousins are Catholic. But as he grows up, the follow-up questions (Why am I Jewish and Daddy isn’t? What is the difference in our beliefs? Who is right?) make me wonder how I can possibly prepare myself for these inquiries. I know that as the number of interfaith families grows, I am not alone in my doubts about my own ability to gracefully navigate the tricky waters of these topics. But I also know that while they are certainly more common for my generation than for others, conversations about these differences are not necessarily any easier. Some of my friends knew all along they had no interest in such a complicated and potentially fraught situation, and they never considered marrying someone of a different faith. Others, who, like me who are in an interfaith marriage, are avoiding the issue by pushing religion out of their lives altogether. Neither of those routes were viable—or even desirable—options for me. I fell in love with a man who was raised Catholic, but have always known that I wanted very much to have Jewish children. Having talked about it long before we were married, my husband has always supported me in my efforts to build a Jewish home. I appreciate that he has learned a great deal about my heritage and culture, and I smile every time I hear him tell Isaac to wash his zeise punim. But I still feel more trepidation about explaining the differences in our religions than I do about the inevitable questions about where babies come from. Those conversations will be based on fact, and the answers will be the same for everyone. When the religious discussion (or discussions, as the case will certainly be) happens, it will be about faith, as well as about history and holidays. And there is no biological formula for me to fall back on. So at some point we will have to delve into why people hold the beliefs they do: why in our family we don’t believe in hell, and why Grams does believe that Jesus was the son of God. And frankly, the only answer I can currently come up with is “Because we don’t” and “Because she does.” I know this will not be sufficient—for Isaac or for me. Apart from anticipating the difficulty of taking on such huge questions, I also worry that somehow both the questions and the answers with weaken the strength of vital bonds he has formed with his dad’s side of the family. I don’t doubt that they will always love each other, but I’ve realized that as we build and reinforce familial ties, we spend a lot of time emphasizing similarities: “Oh, you have your uncle’s dimples, your mother’s eyes, your grandpa’s terrible sense of humor.” While we also celebrate him as an individual, I think Isaac likes hearing about these very tangible ways in which he is connected to his family. I worry that it will be jarring to him when we talk about profound ways in which we differ from the people with whom we are supposed to have the closest connection. Having friends who celebrate different holidays and have different customs will probably feel exciting, and interesting—I know it did for me. But if so much of family life is based on shared traditions and belief systems, then won’t being told that these parts of his identity are fundamentally different from those of other family members be confusing, and even a little sad? 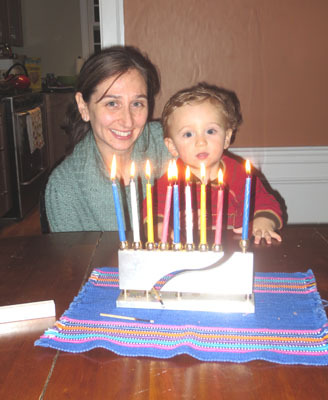 I want Judaism to be a source of joy and community to Isaac, not sadness and isolation. All of that said, I am confident in my heart of hearts that we will emerge relatively unscathed from this process, but I’m a Jewish mother and worrying is included in my job description. I am somewhat reassured that there seems to be a general consensus among the resources I have read, and the experts with whom I have spoken, that if respect, communication and positive experiences with both religions—even the one in which they are not being raised—are present, children will be able to absorb the differences in their families and integrate them into their own identities in a healthy and meaningful way. So on second thought, perhaps my concern is as much about how different Isaac’s Jewish identity will be from my own as it is about how to explain the variance of beliefs within our extended family. But that, I suppose is another worry for another day. 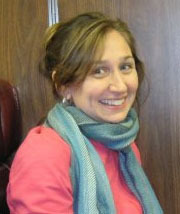 Rachel Ross lives with her husband and son in Boston, MA.